Anchor with ease using the Vibe Anchor Pole. A simple, dependable solution for anchoring your kayak. Shallow Water Anchors are lightweight, easy to install and slide quietly into the water so they won't scare the fish away. They'll keep your boat pointed into the wind or current, plus prevent damage to grass, lake or stream beds. 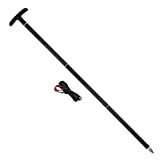 Vibe anchor poles come with 2 mini pole clips and stainless steel hardware for mounting your stick anchor to the boat while not in use. Easily separates into three separate pieces for compact storage. Includes all necessary mounting hardware. Fine Material: Our FISHINGSIR folding anchor was made of pure galvanized iron, it does not need any painted coating to keep it resistant to rust - The Simplest is The Best! This folding anchor system includes a 40ft long, more durable marine grade rope, which allows for more horizontal drag and better hold. We also add a high-visible EVA floater (ethylene-vinyl acetate copolymer) and a stainless quick-release carabineer to this system for situations need a quick disconnect. The Greatest Size: 3-1/3 pound 4-fluke folding anchor will hold in mud, sand, gravel, rock and any other situations. The galvanized iron folding anchor is approx. 12in * 12in when it be opened and is approx. 12in * 3in when it be closed and put into the matching nylon storage bag. Honestly speaking, it only takes up min. space and could be easily stored in all small boats, including kayaks, canoes, dinghies and PWC. How to Use: Just take it out of matching storage bag; simply lift the collar to let the 4-fluke be opened naturally and slide the collar back down to lock place to fix the flukes. That is all, it easy to be used! You can use the rope as long as possible to create a better horizontal drag on the bottom of ponds, rivers, lakes or oceans. The Heat Sealing Technology@ used on our rope tying process, which makes our anchor system could support more drag at any difficult situations. Multi-functional Use: Our folding anchor system designed for boats, sailboats, personal watercraft, inflatable boats, canoes, and float tubes. It also designed with the Kayak FISHING in our mind. The compact size and folding design will not get in the way of your fishing gear and its 4-fluke is ideal for sandy, weedy and rocky bottoms. When the fish are biting, you will not want to be drifting away fighting for position. 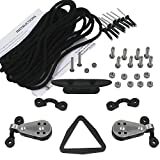 Risk Free Purchase: 100% satisfaction guaranteed - FISHINGSIR loves our customers, we would provide full refund or replacement to our customers if they do not satisfy with this complete folding anchor system. Buy it now and enjoy your adventure today! Our quality kayak anchor is exactly what you need to secure your small craft on a pond, lake, river or even a calm ocean. It's made from premium quality hot-dipped galvanized iron that is 100% rust-resistant unlike other painted anchors that will chip and rust over time. 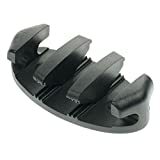 The Shoreline Marine propel zig-zag cleat makes tying off your kayak anchor or kayak to the dock easy. 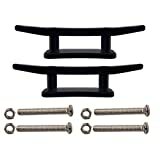 Made with durable black nylon, this 3.5 inch cleat is easy to install and has many uses while out on the water. The zig-zag design provides a stable, secure access point for securing your anchor. Includes stainless steel Hardware for easy mounting. 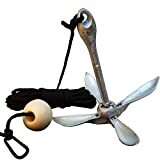 ANCHOR FOLDING GALV 1-1/2 lb. This galvanized, four fluke anchor is lockable in an open or closed position and is perfect for personal watercraft and dinghies. Folds up for easy storage. Available in 4 sizes. 1-3" Anchor Cleats with 2 stainless steel Screws and 2 stainless steel nuts. 2-stainless steel Anchor Pulleys with nylon sheave. 30 Feet (9 metres)-Braid 6 mm Trolley Line Instruction are included. Grapnel anchors are ideal for your kayak, PWC, canoe, or float tube. They're light, yet effective in a very wide range of anchoring situations, and fold neatly for convenient, space-saving storage. Attwood develops high value, engineered marine products to make life on the water easier to enjoy. Made to meet the demands of boat builders and distribution partners, our products are extensively tested on-site in our lab to provide worry-free boating under all conditions.